Taking friends and family out for their first cruise can be exciting and you want everyone to enjoy their time on the water. If the conditions are less than ideal, you’ll want to take some extra measures to ensure everyone’s comfort. Here are tips for keeping everyone content and safe from Quantum expert Andrew Waters. Before heading out, spend some time reviewing the forecasts for where you are and where you’re going. Be realistic about the experience level and comfort level of the guests you’re taking on board – a gusty day might not be the best choice for a group of novices. Checking the weather before you leave will help you plan for the day and set realistic expectations with your passengers. Click here for some of the apps and sources we like. Once you're on the water, keep and eye on the horizon and boats ahead of you. If you start to see white caps or boats heeling over, it might be time to add a reef (click here for a good article on that) or head back. It's also important that you keep an eye on the forecast as they can change quickly, especially on the water. If you have mobile service, you can monitor it on your favorite app. Regardless, always remember to trust your eyes and what you see over what your electronics are telling you. While you’re still on the dock, give everyone the rundown of what to expect on board and set realistic expectations. Make sure you know the physical abilities of each passenger, and hand out life jackets and other safety equipment sparingly (though there should always be more than enough safety equipment to go around whenever you leave the harbor). 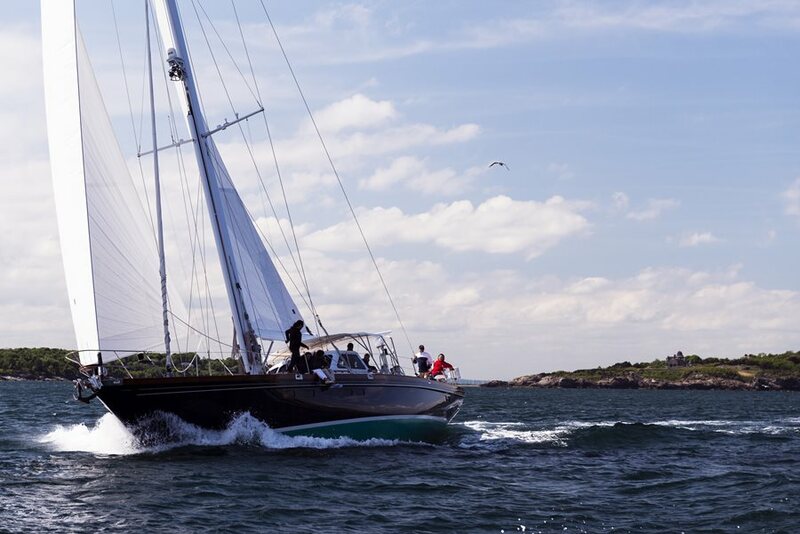 If your guests are non-sailors, click here for some more great tips to make sure they have a good experience. Make sure your rig set-up is inspected annually by a rigger (always a good idea for insurance, too) so your boat is able to handle conditions, particularly those that change quickly. While cruising boats often have limited on-water rig adjustments, an adjustable backstay is the most common. Playing your backstay — having more backstay in upwind breezes and less in downwind — will keep your rig ready to handle whatever comes across the water. After checking the weather, you should have a good idea of how much sail you’ll need for the conditions, but err on the side of caution. It’s easier to shake out a reef than it is to put one in when conditions pick up or get puffy. If you need help with how many reefs to use or where, click here for a guide to get you started. Start your sail with a conservative amount of canvas and you’ll have more control. You can always add more later if needed. If you feel like you're not equipped with the right sails feel free to reach out to our team to see what else might be out there. You can also explore these guides on building your inventory: headsails, mainsails, downwind sails. Set-it-and-forget-it won’t work on a puffy day. In puffs, ease the sails or head up to reduce sudden heel or overpowering. You can sheet in when the puff passes if you need more headway. You’ll be easing and trimming more than in consistent breeze, so don't forget you can assign roles to your guests if they're comfortable helping. Rotate them on and off the sheets to keep anyone from getting too tired. The skipper’s confidence level and attitude will filter down to all those aboard. If he or she seems concerned, the passengers will pick up on that. Know what you’re doing, and direct with confidence. If there is an emergency situation, like a man over board, act calm (even if you don’t feel calm). Your passengers will respond in kind. If it’s getting wild on the water, try to sail downwind (which will keep the boat flat) or head into the wind as much as possible to minimize heel. How you respond will depend on the direction of the wind and your voyage. If you’re under canvassed, you should be able to maintain control of the boat at both points of sail, as long as you maintain forward motion. If building waves and breeze have your guests turning green, there’s not much you can do besides returning them to shore. Find a comfortable place for them to sit (ideally on the leeward, forward portion of the cockpit). This minimizes the chances that they’ll slip and fall while woozy, and if they do get sick, they don’t have far to go. Plus, if they’re comfortable and secure, chances are they’ll nod off until you get home. Click here for a few tips on seasickness our team put together. Have fun on the water and don't hesitate to ask if you have any questions!